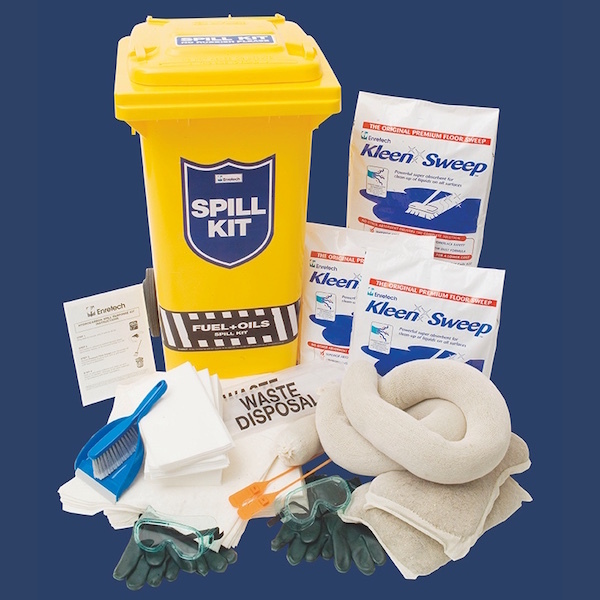 The Service Station Spill Kit is designed for petrol stations, depots, workshops, and warehouses, to contain and clean up hydrocarbon spills. It is effective on fuels, oils, and hydraulic fluids. These kits should not be used on hazardous chemical spill, instead the Hazardous Chemical Spill Kit should be used. For use by any business that uses or stores hydrocarbons (oils and fuels). This includes Government, Heavy Industry, Transport, Manufacturing, Service Industry, Health & Medical, Agriculture, Construction, Waste Management Companies, Consultants. Highly absorbent — each kit absorbs up to 118L of oil. Comprehensive solution — can be used on a wide range of hydrocarbons. Kit contains a combination of Enretech sorbents, PPE and clean-up accessories.